Chandigarh happens to be the entry point to hilly resort to Shimla and lies in the foothills of Shivalik while Shimla is the beautiful hill station, which usually remains flocked by tourists almost all throughout the year. Both the cities at present have been seeing cloudy sky conditions with rains over some parts. Shimla, on the other hand also saw some snow making way causing the winter chill to increase over Shimla to quite an extent. During the last 24 hours from 8:30 am on Monday, Shimla has recorded a good 18 mm of rains coupled with some snow, while Chandigarh saw some good rains of 10.6 mm during the same time frame. Today also, moderate rain and snow will continue over the city of Shimla and Chandigarh will continue to see some rainfall. Tomorrow onward, these rains are expected to reduce, however, for the next three days or so, light rain and snow will continue over Shimla, along with which light showers may be seen over Chandigarh as well. Talking about the city of Chandigarh, due to these rains, minimums have witnessed a rise and are settling at 11.9 degrees Celsius, which happens to be above normal by 6 degrees. The monthly normal rains for Chandigarh are 33.1 mm in the month of January. The ongoing spell has been the first significant one. Before this, rainfall was observed on three occasions, however, they had remained light. 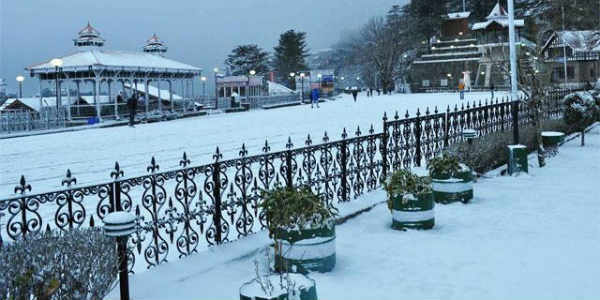 Shimla had seen lighter rains on January 7 and 13, and its normal rains stand at 53 mm for January, which means the city has only reached halfway in terms of January rainfall. Talking about temperatures, they have fallen to quite an extent and dropped from 6.9 degrees yesterday to a whopping 0.7 degrees today. Temperatures will continue to remain the same as rains are likely to occur for some more time.